On Thursday Charles Garvey, CEO of Metabolomic Diagnostics visited us in the lab and gave an interesting talk on business interactions and feedback loops within customers, investors and the team itself. After the presentation, Mr. Garvey visited every team in private, listened to pitches and business models and gave some useful advice on our project. It is very helpful to get input from as many different mentors as possible that every niche of our business is questioned and we learn to improve our skills on every domain of the company. As the D60 demo day came nearer, we had a final training session on Monday, mentored by Alan Clayton, business coach at SOSventures. Every team presented the eight minute pitches, preliminary versions of the pitch we will give on the “real” demo day in front of all the possible investors. On Tuesday, Eithne McShane, director of Fiospharma gave a talk on pharma companies. Luckily enough, we do not aim to be on that market, since chances of succeeding are rather low due to necessary clinical tests. On the same evening our CEO, also known as “constantly beeing over the european skies” arrived, accompanied by Kathi. Now our team is nearly complete in Cork and Christof will stay to the end of the program. On Wednesday we heard our pitch about a thousand times. And after that, a thousand times more. And after that, D60 started. There was a perceptible tension in the room as time went closer to the presentations, although “only” a few investors were present. Christof did very well on his presentation as we all did the presentations in our minds with him, everyone knowing it by heart. 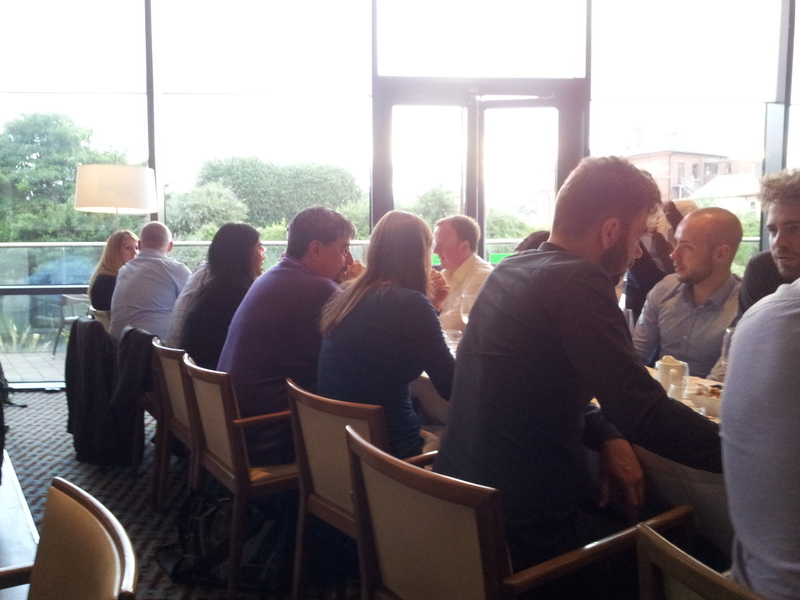 After the presentations, tension loosened noticeable and we all were able to enjoy a fabulous dinner at the River Lee Hotel, thank you for the invitation Bill! Thursday we met with Paul Lee, CEO of Viewson, at the DesignerDojo hacker space and shot our first scenes for the kickstarter campaign video. 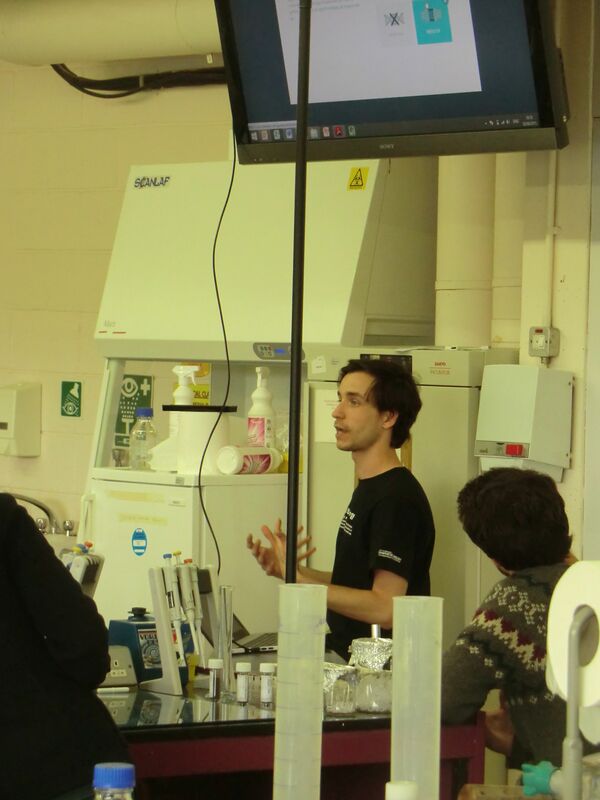 Also, Paul provided very useful informations about 3D printing, he definitely has a mind full of creative ideas. Stay tuned for our video and the kickstarter campaign, this will be our weekends task. Am Donnerstag besuchte uns Charles Garvey, CEO of Metabolomic Diagnostics im Labor und hielt einen interessanten Vortrag über Interaktionen innerhalb der Geschäftswelt und Feedback Schleifen innerhalb der Kunden, dem Team und den Investoren. Nach der Präsentation besuchte Mr. Garvey jedes Team einzeln, hörte sich die Pitches und Geschäftsmodelle an und beriet uns zu unserem Projekt. Es ist wichtig und absolut unverzichtbar, sich den Rat von so vielen Mentoren wie möglich anzuhören, um jede Nische unserer Firma zu hinterfragen und uns auf jeder Ebene verbessern zu können. Alan Clayton, Business Coach von SOS Ventures leitete am Montag das letzte Training für den D60 Demo Day. Jedes Team präsentierte die vorläufigen Versionen der acht Minuten Pitches, die auch beim „echten“ Demo Day vor den Investoren vorgestellt werden. Am Dienstag hörten wir einen Vortrag von Eithne McShane, Direktorin von Fiospharma, über Pharmafirmen. Zum Glück ist dies nicht unser Markt, weil wegen der nötigen klinischen Testphase viele Firmen aufgeben müssen. Am selben Abend kam unser CEO, auch bekannt als „immer über den europäischen Wolken“ in Begleitung von Kathi in Cork an. Nun ist unser Team fast komplett hier und Christof wird bis zum Ende des Programms auch in Cork bleiben. Am Mittwoch hörten wir unseren Pitch ungefähr tausend Mal. Danach hörten wir ihn wieder tausend Mal. Und danach begann der D60. Die Spannung war fühlbar im Raum, obwohl „nur“ einige Investoren anwesend waren. Christofs Präsentation war sehr gut und in unseren Köpfen sprachen wir den Pitch mit, mittlerweile können wir ihn ja alle auswendig. Nach den Präsentationen lud uns Bill zum Abendessen ins River Lee Hotel ein, tausend Dank dafür! Wir besuchten dann am Donnerstag den Hackerspace „Designer Dojo“. Paul Lee, CEO of Viewson, ist ein kreativer Kopf und half uns, einige Szenen für unser Kickstarter Video zu drehen. Ausserdem ist er eine Instanz in Sachen 3D Druck, hat viele Kontakte und Ideen. Am Wochenende werden wir dann das Video fertigstellen, haltet alle die Augen danach auf! Remember the Beatles song “Hello Goodbye”? I said goodbye to Cork to assist in a seminar at the university of Graz two weeks ago, now it’s hello again. In the meantime, our growth lamps for the algae arrived and we set them up the day after I was back in Cork. But we said goodbye to our algae, said hello to yeast, said goodbye to yeast and said hello to bacteria to produce our product, because algae can not provide a sufficient biomass to produce our product on a large scale. Additionally, we said hello to Christof on Thursday and said goodbye to him on Saturday. It was a rather short but nevertheless productive visit, since he was able to talk to Sean O’Sullivan about business models, our product and how to attract potential customers. Also Christof pitched Bill and for the first time presented a preliminary version of the full- length eight minute pitch. The feedback was quite positive, although there is still a lot of effort to be put into it, especially on the numbers we are going to present. On Sunday morning at 4am Christof left for the airport (good performance lad; that would be way too early for me…) and we said goodbye on Saturday while having a really delicious dinner at a Chinese restaurant. The remaining team went to the lab on Sunday to set up some experiments and continued them on Monday. On Tuesday we had a mentor session with Steve McCann, who is the CFO of SOSventures. Finance management is the backbone of every good running company but hard to keep track on, if you are not experienced. Also, investors and possible partners could silently take over your company. There are so many pitfalls, when you do not keep track of the financial management. There is a lot to be learned for us on so many different topics so we say “hello” to many terrains which are new to us. Kennt ihr den Song “Hello Goodbye” von den Beatles? Ich habe vor zwei Wochen Cork goodbye gesagt, um bei einem Seminar an der Universität zu assistieren, nun heißt es wieder hello. In der Zwischenzeit kamen die Wachstumslampen für unsere Algen an, die wir am Tag nach meiner Rückkehr aufbauten. Allerdings sagten wir goodbye zu unseren Algen, hallo zu Hefe, goodbye zu Hefe und hello zu Bakterien, die wir zur Produktion unseres Produkts einsetzen möchten. Die Algen gaben wir auf, da die Biomasse nicht ausreicht, um unser Produkt in größerer Menge zu produzieren. Am Donnerstag sagten wir hello zu Christof und goodbye am Sonntag. Es war ein kurzer, aber produktiver Besuch bei dem er die Gelegenheit hatte mit Sean O’Sullivan über Geschäftsmodelle, unser Produkt und über mögliche Kunden zu sprechen. Christof pitchte dann Bill mit einer vorläufigen Version des acht Minuten Pitches, den er am Demo Day vortragen wird. Es gab recht positives Feedback dazu, obwohl noch viel Arbeit in den Feinschliff gesteckt werden muss, ganz besonders in die Evaluation der Zahlen, die wir präsentieren werden. Am Sonntag um vier Uhr früh (viel zu früh für mich, gute Leistung mit dem Aufstehen!) musste Christof den Rückflug antreten und wir verabschiedeten uns am Samstag bei einem leckeren Essen in einem Chinesischen Restaurant. Das übrige Team begab sich am Sonntag ins Labor, um Experimente anzusetzen, die wir am Montag fortführten. Am Dienstag hörten wir einen Vortrag über Finanzverwaltung einer Firma von Steve McCann, dem CFO von SOSventures. Gutes Finanzmanagement ist das Rückgrat einer gut laufenden Firma, aber schwer zu managen, wenn man nicht die nötige Erfahrung hat. Auch kann im schlimmsten Fall die Firma still und heimlich von Investoren übernommen werden, wenn man das Finanzielle nicht im Blick hat. Es gibt viele Fußangeln in diesem Bereich und man muss immer ein Auge auf diese Seite des Managements haben. Es gibt noch viel zu lernen für uns, in so vielen unterschiedlichen Bereichen, deshalb sagen wir „hello“ zu allem neuen das wir lernen! 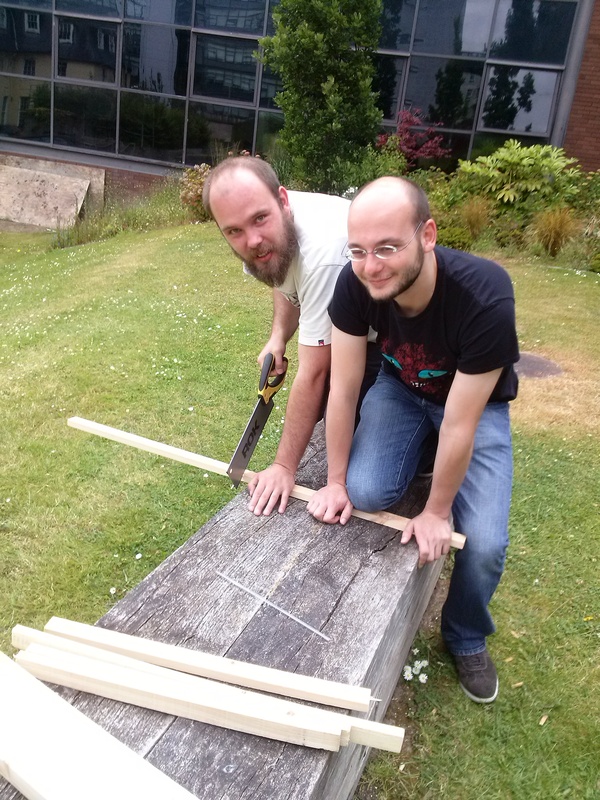 Sawing wood for the installation of the lamps. Our cultures now have a beautiful pink lighting. Sean O’Sullivan visiting the lab. And he brought a TV Crew. The last week was very rich in variety with a lot of mentoring sessions. 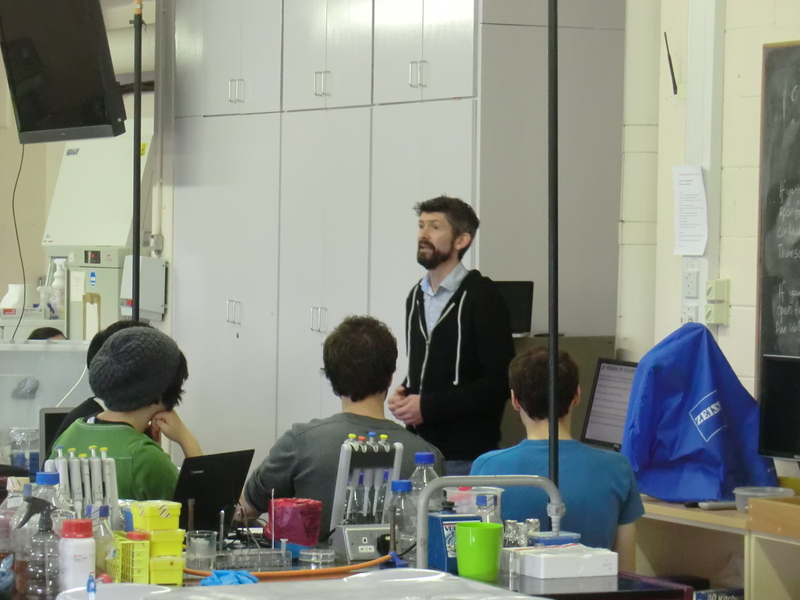 On Monday Sean O’Sullivan – the owner of SOSventures – visited the lab and told us what is important for a young start-up. He not only gave us helpful feedback concerning our 5-slide pitches but also told us reasons why you should not found a start-up company. For example you should never do it for your ego, fame or money. On Tuesday Albert Flynn, professor of nutrition at the UCC, talked to the teams dealing with the production of food. 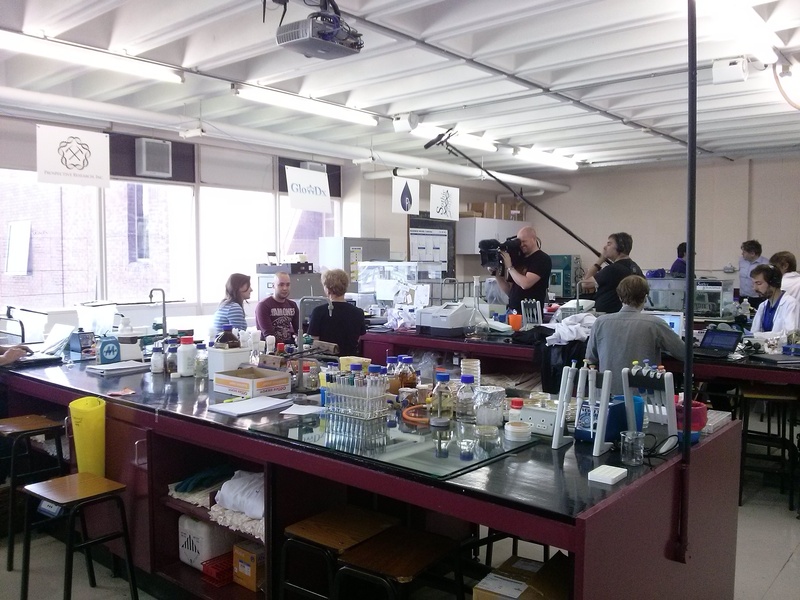 Jenna Redmond visited the lab on thursday. She shared her experience concerning her start-up and reminded us that pitching is the most important thing and that we will have to do that over and over again, not only on the demo-day in Dublin. On Friday Alan Clayton explained the results of our HBDI-Assessment. This is a test that evaluates and describes the degree of preference individuals have for thinking in each of the four brain quadrants, as depicted by the Herrmann Whole Brain® Model. 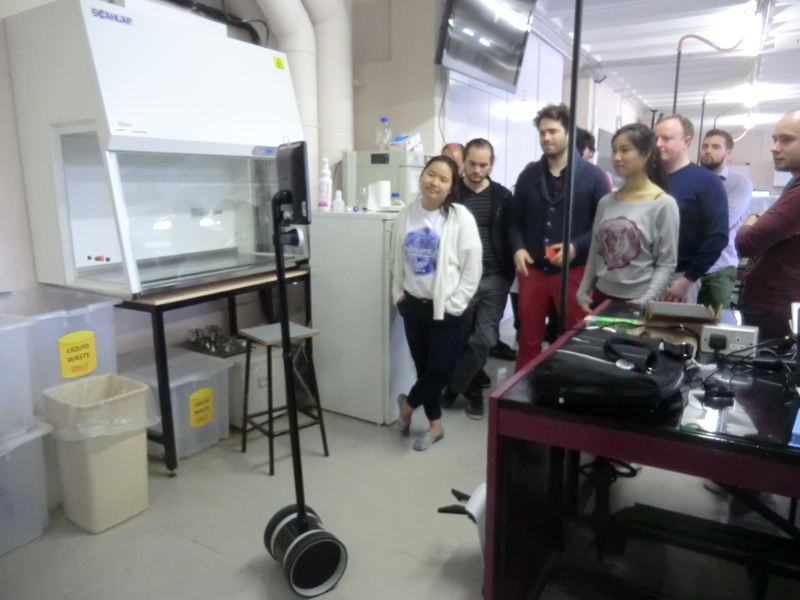 After that we did our 5-slide pitch again but this time it was not Robot-Bill we were talking to because Bill Liao was present in the lab and could give us his first live feedback. He warned us that he will be very critical and it won’t be only nice words we will hear from him but we shouldn’t take it personally. In fact that was exactly what happened. Every group had to deal with the (most of the time) negative feedback but this is the most important one because it brings us forward and we can improve ourselves. The outcome of our pitch was that our main problem is the economy. So right now we have to reconsider if we want to continue working with algae or switch to another organism or maybe a more valuable compound. Die letzte Woche war sehr vielfältig mit jeder Menge Mentor-Sessions. Montag besuchte Sean O’Sullivan – der Eigentümer von SOSventures – das Labor und erklärte uns was für eine Firmenneugründung (Start-up) wichtig ist. Er hat uns nicht nur hilfreiches Feedback bezüglich unseres 5-Seiten Pitches gegeben, sondern uns auch erklärt aus welchen Gründen man keine Firmenneugründung machen sollte, z.B. wegen des Egos, Ruhms oder Geldes. Dienstag besuchte Albert Flynn, Professor für Ernährung auf dem UCC, jene Gruppen, die sich mit der Herstellung von Nahrungsmitteln beschäftigen. Jenna Redmond besuchte das Labor am Dienstag. Sie teilte ihre Erfahrung bezüglich ihres Start-ups mit und erinnerte uns, dass wir immer wieder Vorträge halten müssen, nicht nur am Demo-Day in Dublin. Am Freitag erklärte uns Alan Clayton die Ergebnisse des HBDI-Assessments. Das ist ein Test, der das Ausmaß der Präferenz von einzelnen Personen beschreibt, inwiefern sie in jedem der im Herrmann Whole Brain Modell beschriebenen vier Gehirnquadranten denken. Danach hielten wir wieder unseren 5-Folien Vortrag, aber diesmal war es nicht Roboter-Bill zu dem wir gesprochen haben, weil Bill Liao im Labor anwesend war und uns das erste live Feedback geben konnte. Er warnte uns, das er sehr kritisch sein würde und es nicht nur nette Worte sein werden, die wir von ihm hören, aber wir es nicht persönlich nehmen sollten. In der Tat ist genau das passiert. Jede Gruppe musste mit (meist) negativen Rezensionen umgehen, aber diese sind die wichtigsten, weil sie uns voran bringen und wir uns verbessern können. Das Ergebnis unseres Vortrages war, dass unser Hauptproblem die Wirtschaftlichkeit ist. Jetzt müssen wir uns überlegen, ob wir mit Algen weiterarbeiten wollen oder zu einem anderen Organismus beziehungsweise einem Produkt mit höherem Wert wechseln. Oh those fast times! Everything seems to happen at once and the days go by as if they were seconds. I didn’t even find the time to write a few lines here, I apologize for that, and now the events just pile over my head so I hope not to fill a whole novel but be brief and tell you what happened since the last update. It only feels like minutes that Christof and Kathi left to go back to Austria, though it is two days ago. It was really helpful to have most of our team here and have all the input and inspiring discussions live and not via the internet. 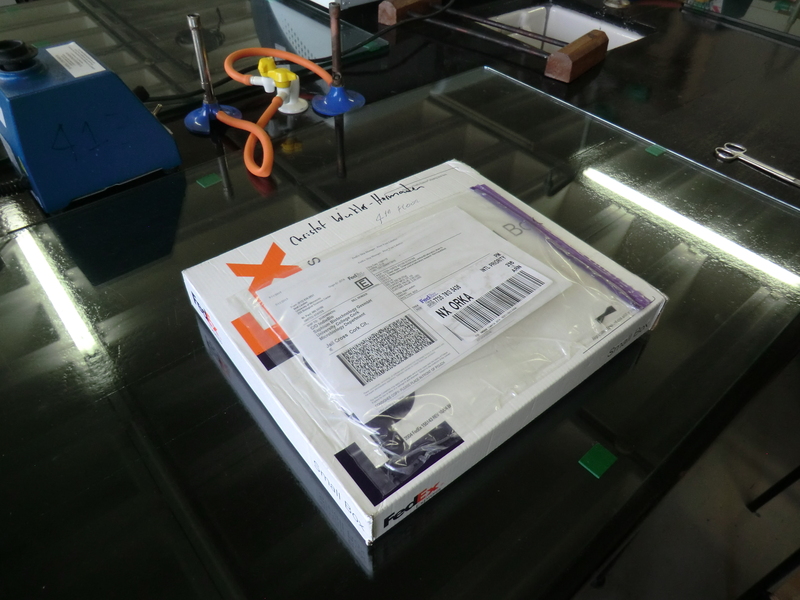 Meanwhile, new chemicals arrived and we raised our stock of things to play with. As Bills homework was someone else than the CEO pitching, Josef was lucky to get the job and he did very well on presenting to the infamous robot. The day Christof and Kathi left, we moved out of our B&B with a tear in the eye, since the landlords were beautiful people and moved in with team Pili for a week. We quickly liked our french friends and their hospitality and chatted with them for hours about everything from apples to zeppelins. 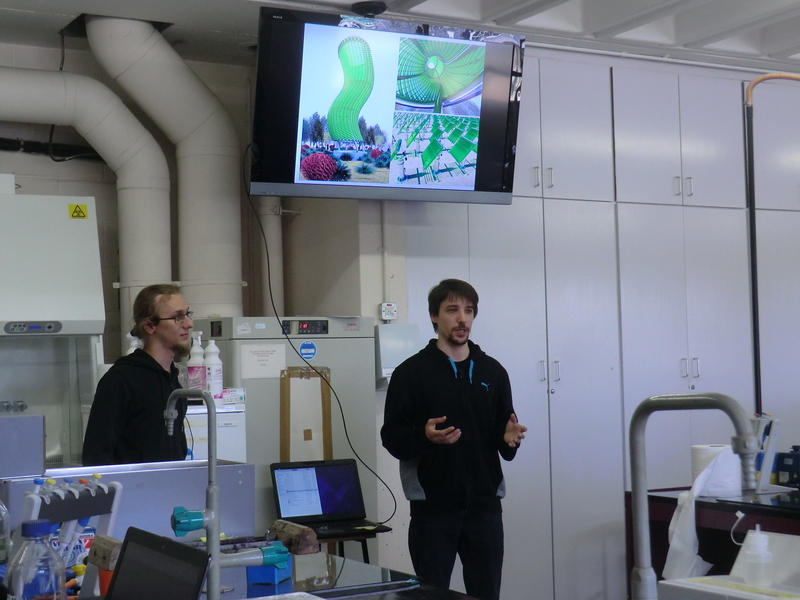 Also on tuesday, Edward Perello, co- founder of DesktopGenetics visited us in the lab and gave some helpful advice on our business model and also the science. The next day, he was lecturing us on CRISPR, which is a milestone in modern genetics. After his talk, all teams had the opportunity to present themselves in front of the UCC staff and I was elected to give the talk for our team. 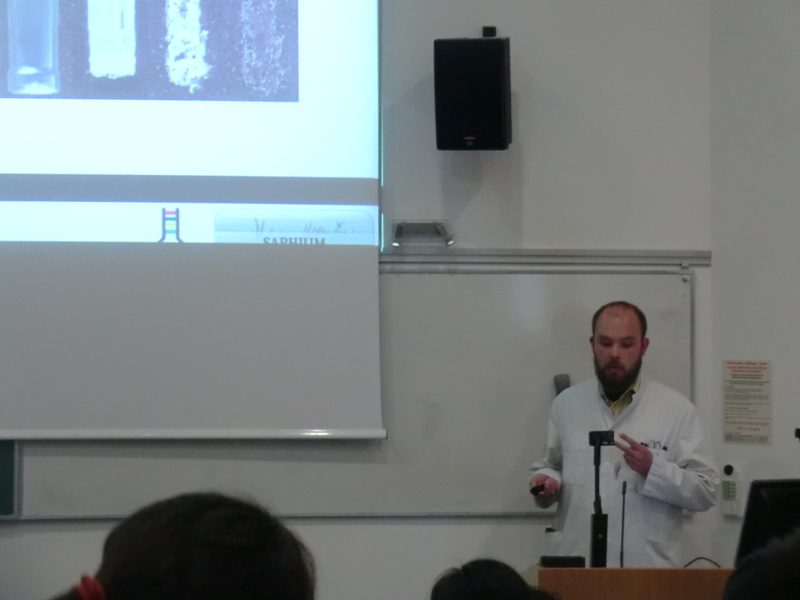 I am always a bit nervous to talk to big audiences, but I hope the talk gave a good impression of what we are on and now the UCC staff knows what we are doing in their lab. The same evening UCC invited the teams and the staff to a delicious dinner, during which we had the opportunity to talk to everybody and find potential collaborates and new friends. Today, we had a “relaxed” lab day and worked hard on our experiments, but also got the brand new lab fashion with our brand new new lab coats with our company logo on them. Will they make us more successful in the lab? I hope so, but at least they are definitely improving our style factor! Oh, diese schnelle Zeit! Alles passiert auf einmal und die Tage fliegen vorüber, als wären es Sekunden. Ich habe nicht einmal die Zeit gefunden, hier ein paar Zeilen zu schreiben, ich entschuldige mich vielmals dafür. Die Ereignisse purzelten nur so auf uns zu und über uns hinweg und ich hoffe, ich kann alle Ereignisse der letzten Tage halbwegs kurz zusammenfassen und werde hier keinen Roman schreiben. Es fühlt sich an wie Minuten, seit Christof und Kathi zurück nach Österreich abgereist sind, allerdings ist das auch schon wieder zwei Tage her. Es war wirklich hilfreich, den Großteil unseres Teams hier in Cork zu haben und mit allen live fruchtbare Diskussionen führen zu können. In der Zwischenzeit erreichte uns auch ein Nachschubpaket an Chemikalien, wir haben nun noch mehr Dinge, mit denen man Unsinn treiben kann. Bills Hausaufgabe für diese Woche war, dass ein anderes Mitglied des Teams und nicht der CEO einen Pitch vorträgt. Josef hatte das Glück ausgewählt zu werden und schlug sich sehr wacker dem berüchtigten Roboter den Vortrag zu halten. Am Tag als Christof und Kathi losfuhren zogen wir aus unserem geliebten B&B aus und verdrückten die ein oder andere Träne, da uns die Vermieter sehr ans Herz gewachsen sind. Wir zogen mit dem französischen Team Pili ein und mochten ihre gastfreundliche Art sofort und unterhielten uns mit ihnen über Gott und die Welt in schier endlosen Gesprächen. Ebenfalls am Dienstag besuchte uns Edward Perello, Mitgründer von DestopGenetics im Labor und versorgte uns mit Tipps und Tricks rund um das Geschäftliche und die Wissenschaft. Am nächsten Tag hielt er einen sehr anregenden Vortrag über CRISPR, einen Meilenstein der modernen Genetik. Nach seinem Vortrag erhielt jedes Team die Möglichkeit, sich kurz vor der Belegschaft des UCC zu präsentieren und ich wurde für diesen Vortrag von unserem Team ausgewählt. Ich bin immer ein wenig nervös, vor großen Menschenmengen zu sprechen, aber ich hoffe unser Thema gut präsentiert zu haben und den Bediensteten des UCC nähergebracht zu haben, was wir so in ihren Laboren tun. Am selben Abend lud das UCC die Teams zu einem köstlichen Abendessen mit den Bediensteten ein während welchem wir die Gelegenheit hatten uns mit vielen Leuten zu unterhalten, Berater und Anlaufstationen für Fragen und auch neue Freunde zu finden. Heute war ein eher entspannter Tag im Labor ohne weitere Termine, allerdings erreichte uns auch die neueste Labormode in Form von Labormänteln mit unserem Firmenlogo. Werden die neuen Kittel uns erfolgreicher im Labor machen? Ich hoffe es ja, aber zumindest steigern sie unseren Style- Faktor erheblich! Josef pitching about a green future. David Perello talking on CRISPR. Reinmar giving a talk in front of the UCC staff. Do not play poker with beginners, since most of them think any two cards make a good hand. Do not try to launch a bluff, since most of the beginners just see this as an opportunity to raise their stacks. And of course, you have to explain the whole game beforehand and get beat by your own tactics. But that Friday was a relaxing poker night, nearly all teams joined in and we had a fabulous evening at the Forma lab. Now everybody in the accelerator program is ready to be a rising poker star. Wayne Murphy from SOS ventures visited us on Tuesday to talk about our business plan and to give us advice on getting potential customers interested in our products. There are loads of factors to be taken into account and to be put into a business model. This model will definitely help ourselves to ask the right questions and to build our company on a solid basis. Tuesday night Christof and Kathi arrived and we welcomed them with a good IPA. To have our CEO and our marketing expert here in Cork makes working on our business plans way more easier, since we would not need “robot Christof” for this week and have him here live to practice pitching and to give helpful input on our lab work. Additionally Kathi provides great new ideas and input on our marketing and works hard on our social media appearances. On Thursday Alan O’Dea gave an amazing talk on start-ups and pitfalls a newly founded company could step into. Taken altogether it all depends on a reliable team and a good financial management. Still it will be a long way to go for our newly born company and a path of trial and tribulation will have to be taken, but our team is confident and surely willing to pull all obstacles out of the way. Spiele niemals Poker mit Anfängern, weil die meisten glauben, dass zwei Karten auf der Hand schon eine gute Hand sind. Probiere auf keinen Fall zu bluffen, weil das die meisten Anfänger das als Möglichkeit sehen ihr eigenes Geld zu vermehren. Und natürlich muss man vorher die Spielregeln erklären, um dann später mit der eigenen Taktik geschlagen zu werden. Am Freitag hatten wir trotzdem einen schönen Pokerabend mit fast alles Teams im Forma Labor. Nun ist jeder Teilnehmer des Accelerator Programms bereit, ein aufstrebender Pokerstar zu werden. Wayne Murphy von SOS Ventures besuchte uns am Dienstag um über unseren Geschäftsplan zu diskutieren und um uns zu helfen, potentielle Investoren für unser Produkt zu interessieren. Der Geschäftsplan wird uns helfen, uns die richtigen Fragen zu stellen und unsere Firma auf stabilem Grund aufzubauen. Dienstag Abend kamen Christof und Kathi aus Österreich an und wir begrüßten sie mit einem guten IPA. Unseren CEO und unsere Marketingexpertin hier in Cork zu haben macht die Arbeit an unserem Geschäftsplan sehr viel leichter, da wir nun nicht mehr „Roboter Christof“ brauchen, zumindest für diese Woche. Christof „live“ hier zu haben ist eine Erleichterung bei der Laborarbeit und wir können ihn besser im pitchen trainieren. Kathi gibt sehr viel neuen Input zu unseren Marketingstrategien und arbeitet hart an unserer Social Media Präsenz. Am Donnerstag hielt Alan O’Dea einen eindrucksvollen Vortrag über Start- up Unternehmen und die Fallen, in die eine neugegründete Firma tappen könnte. Zusammengefasst hängt alles an einem verlässlichen Team und einem soliden Finanzmanagement. Es wird noch ein langer Weg für unsere frisch gegründete Firma werden und es wird ein steiniger Weg wird beschritten werden müssen, jedoch ist unser Team zuversichtlich und gewillt, alle Hindernisse aus dem Weg zu räumen. 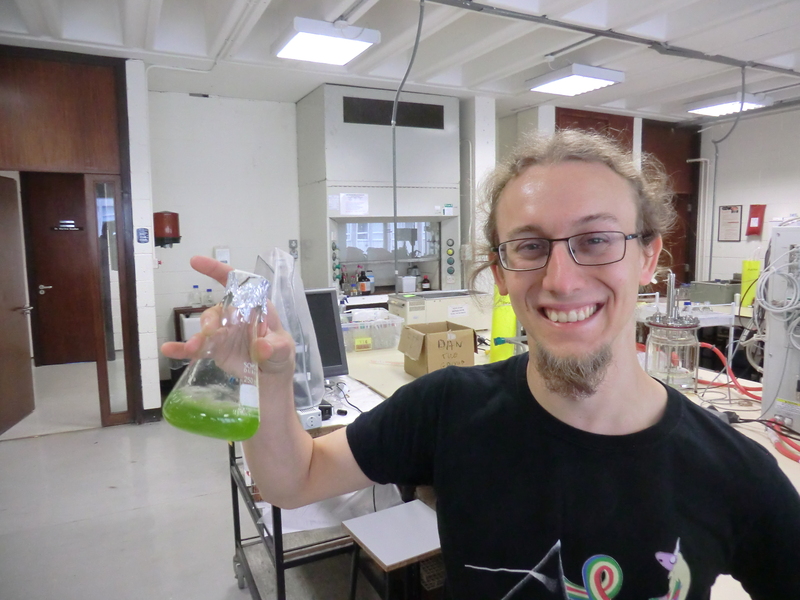 Christof in the lab with our little green friends. Alan O’Dea having a talk about start- ups. Did you like doing homework in school? And did you do them all the time? I think I was quite a bit lazy in school, but here it would be fatal not to do the homework since Bill gave them to us. From his years of experience and expertise we are learning now and will learn a lot in the future. And this will be a particular hard one: we were asked to do our investors pitches with just three slides without any text on them. None, nothing, nada! It will be all about the speech, just three pictures to illustrate it. This one will be a hard nut to be cracked and will require practice, practice and even more practice. As our CEO Christof still has to be in Austria, we have to brief him well and carry on all information we learned about pitching from Sean, Cathal and Bill. This will be a pitching training worth viewing, because it will be robot Christof (the original Saphium “ghetto version” -according to Cathal) pitching robot Bill. Welcome to cyber space! Good news: our Chlamys are feeling well and are beautifully growing. Nearly all petri dishes are covered in a bright green colour. We put some of our little friends under the microscope to take a closer look and say hello today. They told us that they are feeling very fine in Ireland and can´t wait to play games with us. Habt ihr das Hausaufgaben erledigen müssen in der Schule gemocht? Habt ihr sie auch immer gemacht? Ich für meinen Teil war eher faul in der Schule, aber bei dieser Hausaufgabe wäre es fatal sie nicht zu machen, weil sie von Bill aufgegeben wurde. Von seiner Erfahrung und Exertise lernen wir gerade und werden auch in der Zukunft viel lernen. Und diese Aufgabe ist eine schwierige: Drei Bilder, ohne Text und dazu der Investors Pitch. Kein Text auf den Folien, gar keiner, nix, nada! Es geht dabei nur um den Text mit drei guten Bildern zum Illustrieren. Das wird eine harte Nuss und wird Übung, Übung und noch mehr Übung erfordern. Weil Christof nach wie vor in Österreich anwesend sein muss, müssen wir ihm alle Informationen und Ratschläge zum Pitchen, die wir von Sean, Cathal und nicht zuletzt Bill bekommen, weitergeben und mit ihm trainieren. Dieses Training wird wirklich sehenswert: Roboter Christof (die originale “Ghetto Version” auf unserem Firmenlaptop -Originalzitat Cathal) pitcht Roboter Bill. Willkommen im Cyberspace! Gute Neuigkeiten: Unsere Chlamys fühlen sich gut und wachsen wunderbar. Fast alle Petrischalen erstrahlen in hellem grün. Wir haben einige unserer kleinen Freunde unters Mikroskop gelegt, um sie näher zu betrachten und Hallo zu sagen. Sie haben uns gesagt, dass sie sich in Irland sehr wohl fühlen und unbedingt mit uns spielen wollen. Some Chlamys saying hello to all friends of Saphium! Besides the fun part we again had to work on our pitches and the business part of our company and did our first investors pitch. Eight minutes of talk do not appear to be a short time, but it is when you have to fill it with all the information about your company, your business model, your visions and the status of your experiments. This investors pitches will be the hardest talk we ever made and it is a long way to perform a really good one. Later on friday we were talking to a robot. To be exact, it was robot Bill. It was a rather funny picture, a crowd of people standing in front of a talking Segway. But that talking Segway surely knew how to talk, since it made us think hard about our business plans, potential investors and the company in general and how to improve all of these. Indeed, Bill Liao knows how to motivate and knows how to make you think! Neben dem Spaßteil haben wir an unseren Pitches und unserem Geschäftsmodell gearbeitet und haben unseren ersten Versuch eines Pitches für Investoren vorgetragen. Acht Minuten erscheinen nicht als eine kurze Zeitspanne, aber sie sind es definitiv, wenn man sie mit allen Informationen rund um unsere Firma, das Geschäftsmodell, die Zukunftsaussichten und dem Status der Experimente füllen muss. Dieser Pitch für die Investoren wird der härteste Vortrag sein, den wir je geben werden und es wird lange dauern, bis wir ihn perfektionieren. Am Freitagnachmittag haben wir dann mit einem Roboter gesprochen. Um genau zu sein: Robot-Bill. Wie alle Gruppen gebannt vor einem sprechenden Segway standen, war schon ein schönes Bild. Allerdings wusste dieser sprechende Segway, wie man uns anspricht, denn er brachte uns dazu, über unser Geschäftsmodell, mögliche Investoren und unsere Firma generell nachzudenken und wie alles dies verbessert werden kann. Bill Liao weiß halt, wie man Leute motiviert und zum Nachdenken anregt! Presents usually come inside a box and inside there are: toys! Back to the future: the teams talking to a robot. Robot Bill.